Sifaka | This is My Tree! I was photographing the lemur before either the lemur or I noticed the iguana. 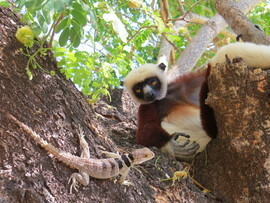 After the perfect pose, the lemur went back to relaxing with his face turned away from the iguana and the camera.